WEC Group has today completed a deal which sees the Coventry-based HTA Group join its growing family of businesses. The multi-million pound acquisition will enable Lancashire-headquartered WEC Group to continue to dominate the UK's laser cutting and fabrication sector. HTA Group, which has a 130-strong workforce and a £10 million annual turnover, joins WEC Group to create a business with 800 employees and a projected £75 million turnover. Founded in 1973, HTA is one of the UK's largest subcontract manufacturers. It is a leading supplier of laser cut parts, sheet metal components and fabricated assemblies. Like its new parent group, it has a strong track record of investment in technology. Wayne Wild, commercial director of the family-owned WEC Group, said: "This is an exciting new chapter for HTA Group, its workforce and its present and future customers. "WEC Group's acquisition of HTA will create a major new force in the UK's laser cutting and fabrication sector and allow both companies to offer more to our customers. "Continuous investment in new technology and in our workforce has been the hallmark of the WEC Group's success and we're delighted to welcome HTA into our growing family. It's a really great fit for our business. "As another family run company we're aware of the name HTA has forged for itself and its reputation for high quality work, service and delivery. Our aim is to build on that. "Both companies share the same values of continuous investment, commitment to training and a strong belief in customer care. That's why we believe this new partnership is right for both businesses." "The expanded group makes us one of the largest laser cutting and fabrication operations in the UK. It means we can offer more services and skills to our customers." 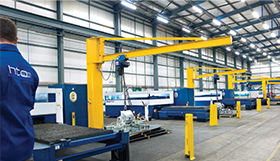 Last year HTA Group, which carries out robotic and manual welding and fabrication at its 95,000 sq ft factory in Coventry, invested more than £2 million in automated laser profiling technology in an installation that was reported to be unparalleled in the country. 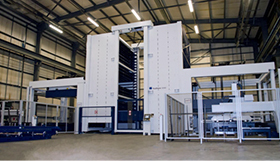 The equipment was made up of two 5kW TRUMPF TruLaser 5040 fiber laser cutting machines (4m by 2m format) with BrightLine fiber technology and SortMaster part sorting automation. The new deal means that the expanded WEC Group will have 23 laser cutting machines working across all its operations, including two tube machines that will allow HTA to offer 3D laser cutting to its customers for the first time. In the past 12 months, WEC Group has invested around £11 million in new machinery and workspace, including £7 million on a new 300,000 sq ft factory in South Yorkshire. WEC's robotic 7.2m x 640 tonne press also increases HTA's current capacity and adds waterjet and plasma cutting to the Midlands operation. On top of that HTA adds CNC Punching to WEC Group's overall capabilities and allows it to offer that function to its existing and future customer base. Steve Hartley, WEC Group founder and managing director, said: "We are delighted to welcome HTA Group and its workforce to WEC Group. This is a logical move for us and for HTA and we look forward to the future with growing confidence."